It's Wednesday which means I'm joining up with other creatives over on Kat's Unraveled post to discuss what we're making and reading. Sadly, I haven't been spending much time reading lately. I'm still working my way through Pressure Drop. 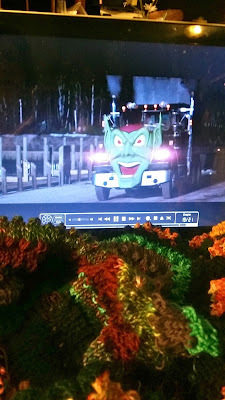 Instead of reading during my spare time yesterday, I watched Maximum Overdrive, one of my all-time favorite movies. Have you seen it? It terrifies my daughter but my husband and I, with our twisted senses of humor, find it hilarious. And highly quotable. Rarely a day goes by that we don't include a quote from the movie in our daily lives. 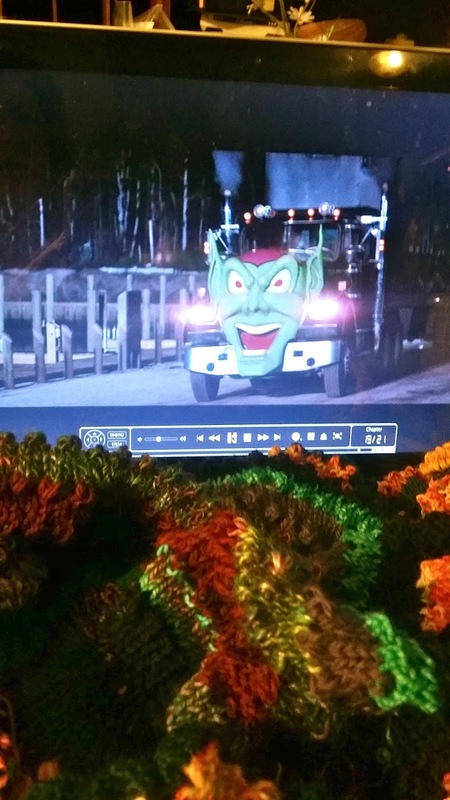 And while I watched and giggled and quoted the lines along with the cast, I knit a few rounds on my scrap pi shawl.